Leading organisations EXPLOIT customer complaints and feedback to provide them with good business intelligence to help them do better business and serve their customers well. However you don't need to be a big company to benefit too! 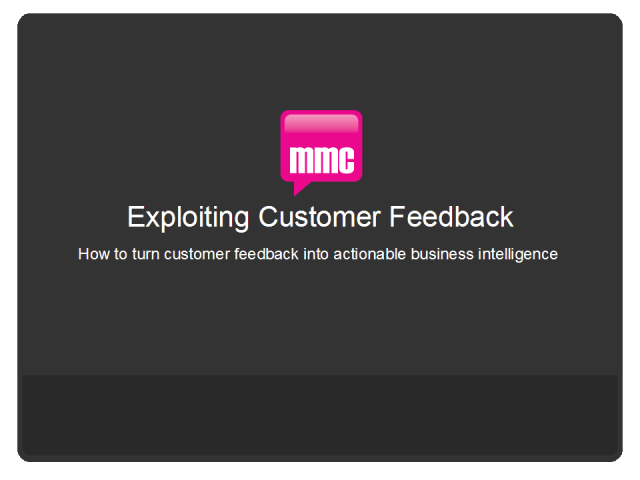 If your company is receiving upwards of 30 pieces of customer feedback per month then we'll show you why, how, and what you can do to start using customer feedback to IMPROVE BUSINESS PERFORMANCE. Bad attitude! Bad for business! Your staff could be killing your company’s success. Research shows that the most important link in the customer connection is staff. And it’s the quality of the interaction between them that will be judged by your customers to determine how much you care about them and their business. Look around your organisation, the warning signs are almost certainly already there. Customer complaints are a good indicator of the problems in your business. Find out how to recognise the symptoms and what steps you can take to ensure your staff and suppliers aren’t unconsciously sabotaging your business. Learn how to use customer complaints and feedback to deliver tangible business benefits - whatever size your company. Ideal for anyone running a business that receives 30+ complaints or customer comments per month.